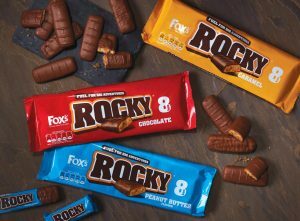 Fox’s Biscuits has relaunched its Rocky chocolate biscuit bars with the help of Leeds agency CHILLI UK. The new design features a more "impactful, dominant brand identity" for the "biscuit bar with attitude". The "biscuit bar with attitude"
Photography of the bar was also reintroduced to "hero" the product while bold colours were adopted to improve visibility and aid range navigation. Belinda Daw, senior brand manager of Fox’s Biscuits, added: “In the competitive chocolate biscuit bar sector, customers are often influenced by promotion. Rocky needed more cut through. CHILLI has also worked on packaging revamps for Butterkist and Yorkshire Provender.